The banner ads that appear on websites that I visit is targeted specifically for me. Do I have any control over this? 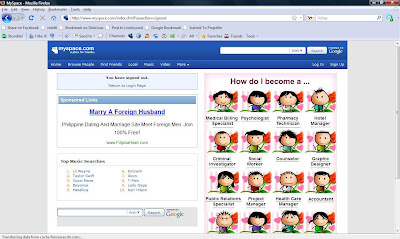 In MySpace, for example, the banner ads that appear when I visit a site is based on what a female, 33 year-old, Filipino will be interested in. I have nothing against Filipino women who want to meet and date foreigners online. I just cannot believe that a highly successful website won't show me other banners on books, music, pop culture, ministry -- other things I am interested in. I think it is so ignorant to simply assume that through profiling, I am most probably interested in being a mail order bride. I had no idea that kind of profiling was going on. Shameful. The advertisers should be embarrassed. I think that kind of overgeneralizing goes on all the time when it comes to different religions, too. Two people might describe themselves as "Christian" or "Buddhist" or any other major Teaching, but I guarantee that if you were ask them a set of questions separately, they would have different answers. At the end of the day, we each walk our own path. I am very sorry that your path is lined with such ridiculous marketing ploys! Stay true to yourself.